Starring: Jeremy Irvine, Emily Watson, Peter Mullan, David Thewlis, Niels Arestrup, Tom Hiddleston, Benedict Cumberbatch, Celine Buckens, David Kross. As you may remember from this post, I lost a horse who was very dear to me and I would give literally anything to have her back. 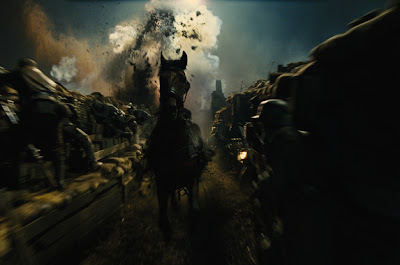 So right from the start, War Horse was going to be a film which I would love. Which is also quite a bad thing, since whilst watching I failed to look at the movie from a critical, 'the-movie-snob-that-I've-become' standpoint. Instead, I was left in tears more often than not. And these moments of extreme emotion weren't because of the really sad parts. In fact, I found myself in tears right at the beginning when Albert (Jeremy Irvine) was teaching Joey to respond to his whistle. This is because I remember exactly what that was like, to build up a bond with a horse that no-one could possibly ever break. And I miss it. I miss everything about having a horse to call my own, whether it be just to wrap my arms around it's neck or head, or have it rubs it's nuzzle up against my face. It may sound stupid to anyone who has never owned a horse in their life, but when you spent 15 years of your life with them and now you're left with nothing, you would understand why there's a huge void in my heart. That's why the story of Albert having his horse taken off him (in the worst possible way - I know exactly how it feels to arrive home and find that my horse isn't there, and it isn't pretty) resonated with me so much, and why I loved War Horse practically more than anyone else did. The film isn't all about Albert trying to find Joey, though. We follow Joey through his huge journey through the horrors of World War I and the different people he meets as he, well, tries not to die. Joey is one heck of a horse, too. As I said to my mother, he had "Katie's colour, Misty's marking and Roger's socks", which just so happened to be three of my favourite horses. Alas, that doesn't really factor into why Joey is amazing. He somehow touches the lives of everyone he meets, whether it be a few soldiers, the Captain who takes him off Albert (played by Tom Hiddleston) or the young girl, Emilie (Celine Buckens) who finds Joey and his friend Topthorn abandoned. 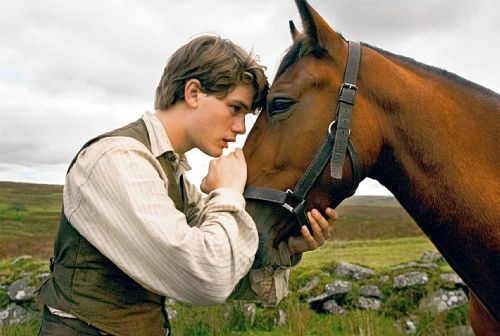 Before watching this movie I had read the original novel by Michael Morpurgo, which was told from the point of view of the horse. It would have been difficult to translate a lot of the soul that was put into Joey's heart-breaking narration to the screen, so I felt like something was lacking there, but Joey was portrayed adequately as an amazing horse, which was good enough for me. As far as book comparisons go, this film improved on the rather limited source material, which was around 170-ish pages, in large print, good enough for kids to read. The large majority of the people in the movie weren't in the book, but the movie did closely follow the book - as closely as it could. I've yet to see the stage show, apparently that is amazing. Many people have called out this film to be pure 'Oscar-bait', which could be true. However, it could have been released at any time of the year and still have been a moving story of courage and friendship against all odds - an Oscar favourite theme, sure, but also a timeless theme. Rest assured, people, while this film has been nominated for six Oscars, I can't see it winning big on Oscar night. As epic as it may be, it is still extremely safe and believe it or not, the Oscars are slowly growing out of that (but not by that much). I do admit, it felt as if Steven Spielberg and his team were trying to hard to recreate the sort of epic that went out of fashion a few years back. Just look at (or listen to) John Williams' ridiculously OTT score. From the very beginning where there are a few aerial shots of the lush British lands, the song that accompanies it probably has every single instrument known to man in it. There was also the moment when Joey was running through bullets, bombs and wire, helplessly, and there is this corny 'adventure' type of song accompanying it. I would have preferred no music at all, and just to hear the bullets and other weapons going off which would have painted a much more horrible picture. If there was one thing I didn't like about the movie, it was that score - but I was detracted by the amount of tears pouring out of my eyes and the fact that my heart was with Joey to think about Williams trying to give me a good schooling on every instrument ever. Spielberg, however, does a brilliant job of directing this film and for bringing a whole lot of humanism to the equine hero. In fact, Spielberg kinda makes you wish you had the humanity that Joey he did - he doesn't know cynicism, negativity or backing down. He never gave up, he had the most amazing courage and stamina. Which is a beautiful thing to see, especially as it is a horse who is making you question who you could be as a human. The battle scenes are also done only as Spielberg could do them, never quite shying away from how horrible that war must have been. I imagine that Spielberg has made this film as 'epic' as he did, with the perfectly set up shots drenched in orange sunsets or muddy battles, because he was thinking more of the future. Right now, what he has done might seem a little aged, but I can see it ageing a lot better than some of the 'now' movies. 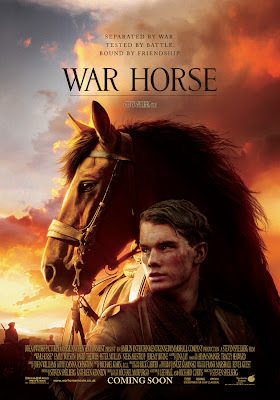 War Horse sure doesn't live up to his best works like Schindler's List, but I really do hope that some people a little younger than me watch it and in the future will show it to their kids (like my mother did with E.T.). It really is timeless. And I applaud Spielberg for taking a risk and creating something timeless rather than something that has 'its time'. As I said, I struggled to see this film from a critical standpoint, so the performances did become the least of my worries. Everyone was good, but no-one was really given enough screen-time to be great. 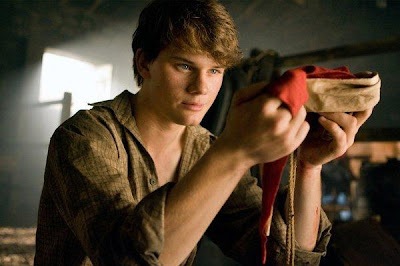 Jeremy Irvine, however, playing the human lead, was most excellent in his role. It would have been difficult for him, the debut actor and 'virgin horseman' that he was, to create such a relationship with several horses that looked fluent. He did a wonderful job of it, and I look forward to seeing what he has in store for the future. However, the film basically begins and ends with Joey and his incredible journey, and the lives he touches along the way. He represents every one of the horses that I've had come into my life, and unfortunately have left. I may sound obnoxious or like one of those 'horsey' people that many brush under the rug for being so nerdy, but there's a reason that people are like that. 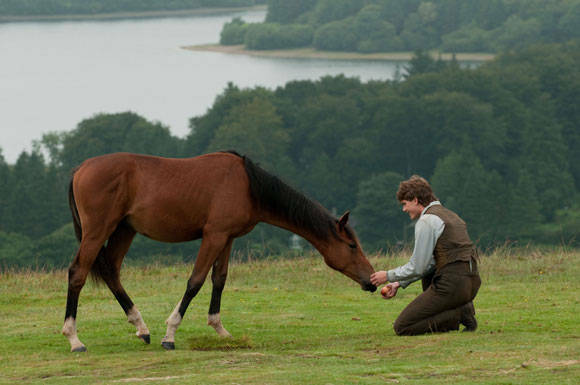 If you should ever have grown up around horses and have them slip through your fingers just like that, you'd know why something like this film would touch your heart more than anything. It almost makes me feel guilty for gravitating towards movies in what would be the final years of me being around horses - I should have enjoyed it more, otherwise I wouldn't be whining about it now. For some, it may have been too safe. For others, it may have been too 'emotionally manipulative'. But for me, this is one of the most personal films I have ever seen. It isn't a masterpiece by any means, nor does it push any boundaries, or exist in the land of obscurity which we cinephiles are supposed to gravitate towards - it just exists in a place in my heart that too few films have ever got to before. Sorry if this review was immensely personal, hard-to-believe, not actually about the film, whatever. I'm not a film critic, just a blogger, and I can write what I please. Aaaw, I understand completely how you feel! :) My friend has a horse, and she told me after she saw this movie (she cried buckets too) she had to go straight home and give him a hug! Any movies involving dogs usually get me going, after the dog I grew up with since I was ONE passed away when she was sixteen. I honestly didn't think War Horse was as bad as everyone else is saying. Maybe I don't think it's Oscar worthy, but still quite touching. Awww, if I had a horse I'd go home and give it a hug too! And I know how that feels, with your dog. I had a horse for 15 years and it was hard to say goodbye. I don't think it is Oscar worthy either, but I don't understand why everyone thinks it is so bad. I haven't seen WAR HORSE, so I cannot pass judgment on it. I have no problem that you loved it, even though I am almost certain from what I have seen and heard that I will hate it. If a movie really moves you emotionally and personally, then it doesn't matter how "bad" the movie is according to others. Some of my favourite movies, such as the intensely personal and very meaningful independent cinema masterpiece THE BROWN BUNNY, are hated by many others. I say good for you that you have found a film that really speaks to you in this unique way. Well done! Yeah, you'll hate it! And no, it doesn't matter, but other's opinions always get the better of me. Thanks! I hated this film, but I can understand why you must have loved it. Films have that power to crossover from the screen, into our lives, which is why we love them so. I mean I found In Bruges extremely personal, and I am no Irish hitman. I've never had pets, and never felt the need for them (aren't I all fuzzy inside?). I don't really like animal movies either. I had a quite opposite idea of how the horse brought about death to everyone it met, even though it was a beautiful horse. Also I hate the name Joey. I really tried liking it... the middle part was making me warm up to it, but that wire-cutter scene came and ruined everything. It really does not deserve those nominations. You found In Bruges personal? Please don't say you killed a little boy! Haha, jokes. That's awesome. I dislike the name Joey, too. It sounds like a kangaroos name, to me. Haha. I am super happy you enjoyed this film so much Stevee. It had to be so, with your love of all things HORSE related. I haven't seen it yet, not my bag, but I need to get it done before the oscars!! Get it done, before the Oscars! You might like it. Thanks! Our first house was new & only cost $137,000 for a 2045 square foot bi-level home in town which included the lot. Beautiful review! I disliked the movie but I can totally see where are you coming from, I love dogs and if for example the animal killed in Dragon Tatttoo would be a dog I'd probably be in tears. I was almost sick in Dragon Tattoo when that happened. Huge cat fan, too. Bloody Fincher. There is no shame in liking a movie that most think it's bad- I am sure everyone has perfect examples for that (mine are Dirty Dancing and Cry Baby), because, as you said, it is all about the connection with the movie- somehow, these films, just raise a flame in you and appeal to you consciously or not; it can be something you have, or desire, or need! In your case, the loss of your horse is the answer! Like I said in my review, for me, a non-lover of animals, it didn't do much, but it's understandable for you! Oh, and you said you didn't watch it with a critical eye- I think you did, there are some great things there! I loved your review! There were a few things that I picked up critically...I'm such a snob! And yes, that is exactly right. Thanks! You're right to mention the emotional manipulation - Spielberg is a master at it. But ultimately storytelling is about playing around with the emotions and the director's focus is on taking his/her audience's emotions on a sort of rollercoaster. I haven't seen this yet but I'm looking forward to watching it. I think that's part of the reason why I love Spielberg's work - I'm an emotional wee one. Wonderful review, Stevee. Films are so personal that it can resonate deeper to one and others can deem it as rubbish, emotionally manipulative, etc. I was quite moved by this film though I do feel that the over-sentimentality did get to be too much at the end. Still it's a good movie and I enjoyed the performances. I'm not into horses as much as you but I was so in love by Joey, what a magnificent creature, he just touched every single human being's life that he comes into contact with. This film has stirred up quite some hate, because of how it is filled with 'typical Spielberg' stuff. Is that particularly bad? Do you hate a Hitchcock film for having suspense similar to another? No. 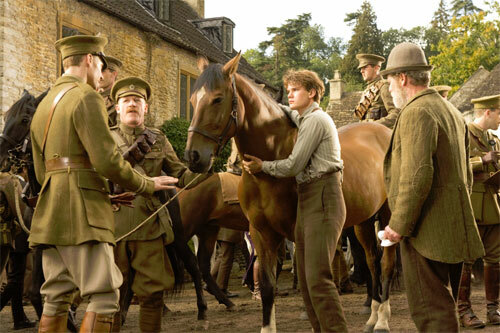 War Horse, while not a phenomenal film is still a great story with sentimentality and engaging. Though, it does have its flaws. Terrific review, and I agree with your final comments. Exactly - I'm glad that someone agrees with me!